Oman Air and APG Canada hosted a celebration to mark the opening of its Canadian Sales Office in Toronto on Oct. 17. The event took place at Le Parc Dining & Banquet Hall in Markham, Ontario and gave travel agents and tour operators a chance to meet with Oman Air and APG Canada staff and learn more about Oman Air’s destinations and in-flight services. 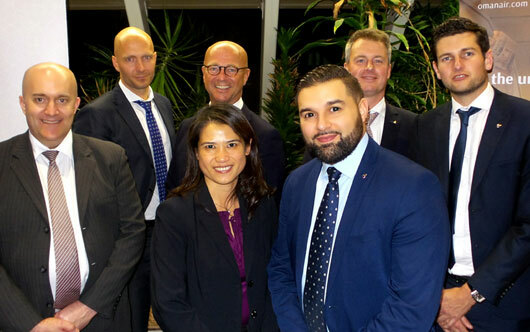 Seen in the photo, front row from l to r, are Jon Murray, Oman Air; Mabel Tang, Oman Air; and Mourad Aoulad El Haj: Oman Air. In the back row, from l to r, are Patrick Stepanek, APG, The Network for Airline Services; James Vaile, APG, Network for Airline Services; Rogier de Jager, Oman Air; and Thomas Scheik: Oman Air.